Ald. 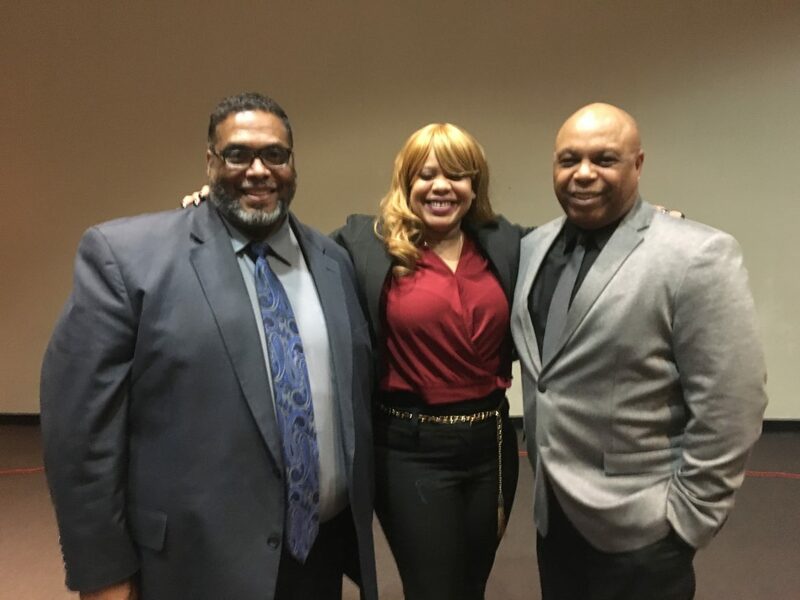 Chris Taliaferro (left), Zerlina A. Smith and Dwayne Truss discussed a variety of issues Feb. 5, 2019, at a candidates forum held at Michele Clark Magnet High School. Ald. Chris Taliaferro made the case Tuesday night for 29th Ward residents to elect him to a second term, while challengers Zerlina A. Smith and Dwayne Truss said they’re better equipped to serve residents the next four years. The three candidates answered questions at Michele Clark Magnet High School about a variety of issues, ranging from foreclosure and education to ethics and parking tickets. But the candidates disagreed on whether aldermen should be allowed to work jobs outside their City Hall position. Both Smith and Truss said if elected, they would only work as alderman. “That six-figure salary you make to represent your community should be your only job and your only focus,” Smith said. But Taliaferro said he doesn’t believe every source of outside income should be banned. Taliaferro said if the figures revealed by the media’s investigation are correct, then the city council may need to take action. The former Chicago Police sergeant said officers who are targeting only certain communities to be ticketed should be fired, and the city’s finance department needs to be collecting fees fairly. But he said financially, the city couldn’t afford to throw out everyone’s ticket fines. Truss, who works as an auditor for the state, said it’s an alderman’s job to analyze trends before they get reported by the media. “Get ahead of the problem.” He suggested the city consider a sliding scale for paying tickets so it’s not such a regressive tax, and he said the city should not let fines double as they do now. The alderman said since being elected in 2015 – he beat incumbent Ald. Deborah Graham in a runoff that year – he’s brought more than $200 million in grants and other funding to the ward. Taliaferro said Hostess now employs hundreds of people, and there are projects underway throughout the ward, including a $30 million youth center on North Avenue backed by comedian Hannibal Buress. The property has already been purchased, the alderman said. Smith, who works for the Institute for Nonviolence Chicago and was an outreach coordinator for state Rep. La Shawn Ford, said there needs to be safe places for young people in the south part of the ward. She wants to tap the $1.3 million in menu money the ward receives each year to put young people to work. But Taliaferro said that money can be spent only on infrastructure. Truss said for years, he’s been involved in the parks, a resource that is already here and needs to be leveraged. He said one difference between him and the incumbent alderman is that Taliaferro “goes along for the ride,” while Truss has been out advocating for the community. The longtime Austin resident said he lobbied hard in 2010 for the manufacturing program now based at the Austin High School campus. “The reality is that not everyone can and should go to college,” Truss said, adding there are all sorts of jobs – like auto mechanic – that pay well. Smith said none of Austin schools are up to date when it comes to technology, and she advocated using the ward’s menu money on education. Taliaferro predicted the state would legalize marijuana in the next year or two and begin taxing the drug. He said he would make sure that money was used to supplement CPS’ budget. He pointed to 32-plus years of organizing and working with different groups on the West Side as to why residents should elect him on Feb. 26th. Truss criticized the alderman, saying he has not being engaged with the entire ward and excluded some from major decisions, like what to do with the former Emmet School building that was purchased by the Westside Health Authority last year. Tuesday’s event was organized by Austin Coming Together and the South Austin Neighborhood Association. The three candidates running for alderman - Zerlina Smith, Chris Taliaferro and Dwayne Truss - will answer questions at the nonpartisan event, which will be held from 6 to 8 p.m. Tuesday, Feb. 5th at Michele Clark High School. The South Central Neighbors Association, Chicago Westside Branch of the NAACP and Austin Coming Together are co-sponsors.